Last season, The Vampire Diaries became my favorite guilty pleasure, as each week introduced new characters and storylines building a complex mythology all its own separate from the books. This vampire story I loved so dearly as a young adult became one I have loved equally as an adult. The tension between "good" vampire Stefan and his "evil" brother Damon, their blood lust and longing for the orphaned and lonely Elena, the way the past has haunted their future and the constant fight for a semblance of normality in Mystic Falls is something I look forward to each and every week without exception. Last season's finale ended on such an incredibly high note with the return of Katherine, in a stunning move that completely blindsided me (I had really hoped that it was Elena that Damon was kissing), and an act of unmistakable cruelty and monstrosity Katherine chopped off John's fingers to separate him from the life-protecting ring he wore. Meanwhile, Jeremy, Elena's younger brother, attempted to take his life in an effort to be reborn immortal with the blood of the now dead Anna in his system. The second season premiere did not disappoint in the least, I was riveted to the screen and felt like my heart was stomped all over right along with Damon. The show has now certainly brought extremely high stakes to each of the character's arcs and I'm very curious as to how these things will progress. PLEASE DO NOT SPOIL ME ON FUTURE EPISODES--Last night's episode is fair game for discussion, but I do not want to know about teasers, casting sides, or anything else you've read for the future as I prefer to be as unspoiled as possible! Elena manages to rush in and save John before he can die. She also manages to get to Jeremy. Elena is extremely reluctant to put the blood of vampires in the ones she loves, when Bonnie suggests Damon give some healing blood to Caroline, she resists at first. Elena dismisses Damon's first attempt to talk about the kiss and later expresses surprise he kissed her. When she attempts to talk to him again about it, she coldly states she's surprised he thought she would kiss him back. Elena bugs me when it comes to Damon, is she really so unfeeling? Stefan recognizes Katherine almost instantly and reacts violently. He is eager to find out why she's in town and what her plan is. 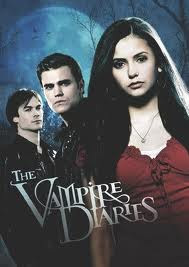 In a surprising scene with John, Stefan forces him to drink some of his blood and threatens him with the idea of becoming a vampire if he doesn't leave town and get out of Elena's life. Later, Katherine confronts Stefan. When he asks her why she came back, she says she has come back for him. He claims he never loved her but was compelled by her. They fight. He says he hates her. She stabs him and delivers one of the most brilliant lines of the show, "You hate me huh? That sounds like the beginning of a love story, Stefan, not the end of one." Oh my boy Damon! So tortured, so beautiful, so blazingly hot, always with the best lines. Damon tries to talk to Elena about the kiss and she brushes him off. It's not until Elena's aunt also states she talked to Elena and Elena can't recall it that Damon realizes what's really going on...Katherine is back. Damon, however, still harbors feelings for Elena and seems skeptical of Katherine at first. Far and away the most stirring scene is when Damon and Katherine come face to face. And yeah they practically rip each other's clothes off, but Damon has to ask, he has to know...has she ever loved him? Katherine is having none of this and shoots him down. No she's never loved him, it's always been Stefan. A distraught Damon goes to Elena and tries to convince that yes there's something between them. She shuts him down. No, she says, "it will always be Stefan." Damon is, naturally, hurt. And in one of the most shocking turns, he snaps Jeremy's neck to turn him into a vampire, the one thing that will hurt Elena the most deeply. Lucky! Jeremy is wearing the ring that protects his family from supernatural harm. As Elena sobs over Jeremy and Stefan comes to her side, she echoes Stefan's earlier sentiments about Katherine..."I hate him." Other Characters: Bonnie annoys the crap out of me. She's so self-righteous! Tyler's family curse and uncle could develop into a pretty interesting storyline. Thoughts on these? Why are Elena and Katherine choosing Stefan over Damon?? This makes no sense to me! Will Caroline wake up as a vampire? This is actually, I think, one of the very best things that could happen to this character who annoys me so much and but it will probably light an even more annoying fire in Bonnie. We've always been led to believe that Stefan is the "good" guy and Damon is the "bad" one. But is this really true? Damon is only a vampire, after all, due to Stefan. Damon seems to me to have quite a sensitive core and a sort of honesty about who he is that seems to be lacking in Stefan. Essentially, I don't think that Stefan or Damon can be boiled down to the simplicity of good or bad, they are both complex. But let's discuss the lines of hatred. Will we see a change in the love story? Will we see a Stefan/Katherine relationship develop and an Elena/Damon relationship come about? Can Elena ever forgive Damon for his action? I have to admit, I had flashbacks of season 6 of Buffy when Spike near raped Buffy--the sort of action you wonder if a character can ever truly recover from. Time will tell! I'm very excited for the season and look forward to the twisty turns each week will take us in the delicious world of the Vampire Diaries! Have you recapped the Vampire Diaries? Leave a link below with your recap. I also invite you to enter my giveaway for a copy of A Visitor's Guide to Mystic Falls.